I joined in the preview program and I don't like it. However, this question may also be relevant to those who install the full version of Windows 10. How can I downgrade back to Windows 8/7 from Windows 10 or Windows 10 preview? To roll back your Windows 10, go to your PC Settings, by typing Settings in the taskbar search bar, next to the Windows icon, and clicking on Settings. It will open the PC Settings. Select ‘Update and Security’. The Update and Security option opens. 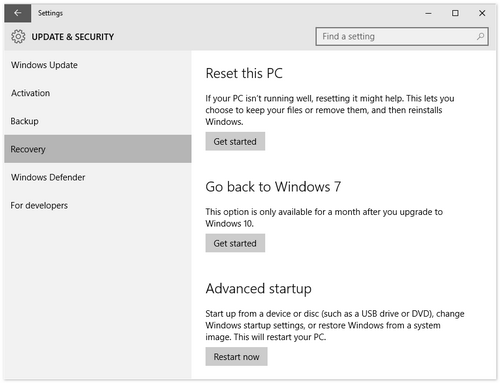 Here you will see options like Windows Update, Activation, Backup, Recovery and Windows Defender. Click on 'Recovery'. Reset this PC: Remove everything and reinstall Windows. This will take your PC to its original factory settings. Advanced Startup: Here you can change your PC settings using a Windows image or a USB/DVD. Short version: there's no way to "Downgrade", you need to reinstall your previous OS from scratch or from a backup. In later versions (and in the final build) if you upgraded, you can revert back to you previous OS for 1 month via Settings > Update & security > Recovery > Go Back to Windows (version #). along with the 'Reset this PC' option. It might be different if you installed from the ISO image though. How do I Uninstall Windows 10? Will it be possible to revert to Windows 8 after installing Windows 10 (not preview)? How do I uninstall Windows 8 Consumer Preview? In Windows 10, is Technical Preview the same as Consumer Preview? How to disable Taskbar Thumbnail preview in Windows 10?